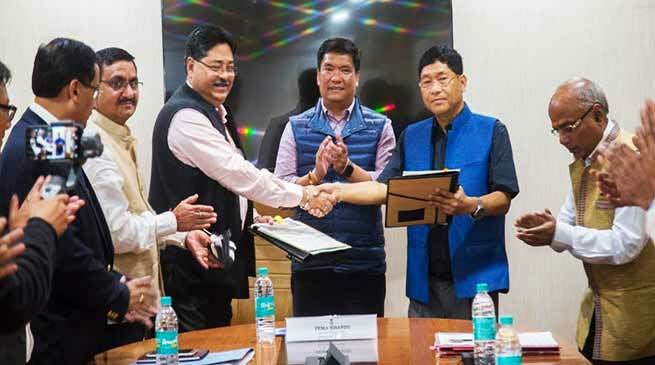 The state government today signed a Petroleum Mining Lease Deed Agreement with Oil India Limited (OIL) for Ningru block in Namsai and Changlang districts. The Central Government had granted Petroleum Mining Lease for Ningru to OIL for a period of 20 years from November 1983. The company had drilled 14 oil wells within Kumchai area of Ningru lease but only one well is producing crude oil. However, the lease had expired in 2003 and couldn’t be reviewed due to various complicacies including forest clearance. With constant persuasion of Chief Minister Pema Khandu the lease agreement has been renewed after almost 15 years. Khandu assured the OIL officials of the state government’s cooperation and assistance in all economically viable projects and requested them to keep the interest of local citizens on top priority. He urged them to recruit more and more eligible local youths in present as well as in future projects of the company.